NEW YORK, Jan 31 (Reuters) - Imposing a temporary travel ban on citizens from seven Muslim countries, President Donald Trump said the move would help protect the United States from terrorism. But less than one-third of Americans believe the move makes them "more safe," according to a Reuters/Ipsos opinion poll released on Tuesday. Trump has pushed back against critics who say the travel ban targets Muslims. He says the "extreme vetting" is necessary to protect the country and its borders. "This is not about religion," Trump said in a statement after announcing the travel ban on Friday. "This is about terror and keeping our country safe." In the Reuters/Ipsos poll some 31 percent of people said the ban made them feel "more safe," while 26 percent said it made them feel "less safe." Another 33 percent said it would not make any difference and the rest said they don't know. Trump's executive order blocked citizens from Iran, Iraq, Libya, Somalia, Sudan, Syria and Yemen and placed an indefinite ban on Syrian refugees. Some Republican lawmakers criticized Trump's order and said it could backfire by giving terrorist organizations a new recruitment message. "This executive order sends a signal, intended or not, that America does not want Muslims coming into our country," senators John McCain of Arizona and Lindsey Graham of South Carolina said in a joint statement. The Reuters/Ipsos poll found that 49 percent of Americans agreed with the order and 41 percent disagreed. Some 53 percent of Democrats said they "strongly disagree" with Trump's action while 51 percent of Republicans said they "strongly agree." Democrats were more than three times as likely as Republicans to say that the "U.S. should continue to take in immigrants and refugees," and Republicans were more than three times as likely as Democrats to agree that "banning people from Muslim countries is necessary to prevent terrorism." Cheryl Hoffman, 46, of Sumerduck, Virginia said she was thrilled that Trump ordered the ban. "I understand that the country was founded on immigrants," said Hoffman, who participated in the poll. "Please, I get that. But I'm worried that refugees are coming in and being supported by my tax dollars." Another poll respondent, Veronica Buetel, 57, of Green, Ohio felt just the opposite: "Yes, we do live in scary times, but there are other, better ways to root out terrorism." Westy Egmont, director of the Immigrant Integration Lab at Boston College, said Americans have grown increasingly hostile toward refugees and immigrants as the influx has shifted from Eastern Europeans to people from countries like Iraq, Somalia and Afghanistan. "The rise of those numbers, as relatively small as they are, have gathered just enough attention to set off a small reaction from people who are genuinely uncomfortable with the diversity around them," Egmont said. Most Americans, however, don't think the country should show a preference for Christian refugees, as Trump has suggested. 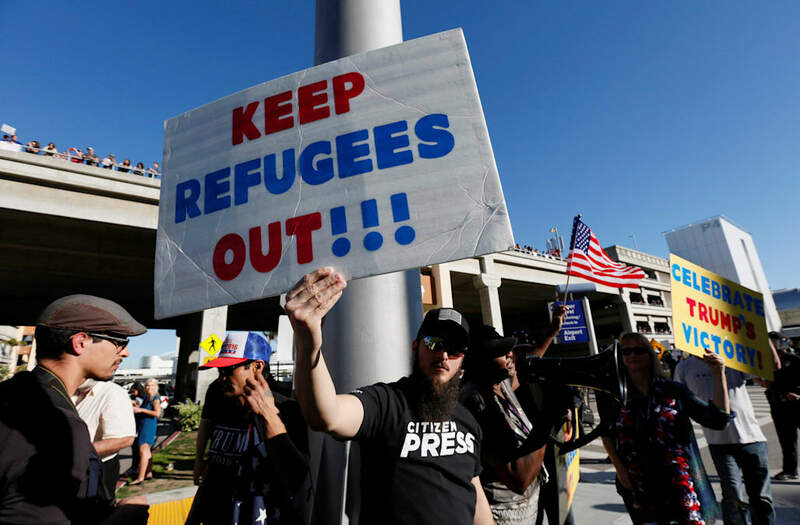 Some 56 percent, including 72 percent of Democrats and 45 percent of Republicans, disagreed that the country should "welcome Christian refugees, but not Muslim ones." On Tuesday, the Trump administration sought to clarify that citizens of U.S. ally Israel who were born in Arab countries would be allowed into the United States.